Chrystia Freeland, a leading figure in the Ukrainian and Canadian campaigns against Russia, was promoted last week in Ottawa to become Canada’s foreign minister. She is now one step away in her plan to replace Justin Trudeau as prime minister, sources in Ottawa, Washington, and Moscow report. There was a hitch in the plan, though. Freeland had been hoping for a senior ministry when Trudeau took power in November 2015. Instead, he gave her the low-ranked international trade portfolio to keep her out of Canada as often as possible. Freeland then counted on Hillary Clinton to win the US presidential election last November, in order to persuade Trudeau she had better relationships in the coming Washington administration than the incumbent foreign minister, Stéphane Dion. The election of Donald Trump, with whom Freeland has no relationship and no agreement either, disappointed but didn’t deter her. Trudeau has also accepted the Freeland scheme, and also for a Clinton reason. Trudeau will be safer in the prime ministry, Ottawa sources believe, if Freeland follows the Clinton role model into public acrimony, private hysteria, then defeat. The usually dignified Dion departed his office last week, not by saying he wished Freeland well, but that he wished her luck. He meant Freeland, whom he blamed along with Trudeau for his abrupt ouster, would need it. “For one year”, Dion (right) said, intimating that he had been caught unawares, “Prime Minister Justin Trudeau gave me the honour of being his Minister of Foreign Affairs. As is his privilege, he has just entrusted this great responsibility to another person. I wish Chrystia the best of luck.” Freeland’s supporters crowded into the Canadian media to celebrate. Dion’s supporters say he was ambushed repeatedly during his short tenure, made to take the blame in public for policies decided by others, while being kept away from decisions that were Dion’s prerogative to take, but his rivals pre-empted. This version of Dion’s ambush gives all the credit for the conspiracy to Trudeau. Another Canadian source suggests Trudeau isn’t clever enough, and that more than half the credit for the plot should go to Freeland herself. In Brussels, sources who report on NATO say that among the military alliance leaders Trudeau’s reputation for low intelligence “approaches, if it doesn’t exceed” that of Anders Fogh Rasmussen, the former Danish prime minister who was NATO secretary-general between 2009 and 2014. 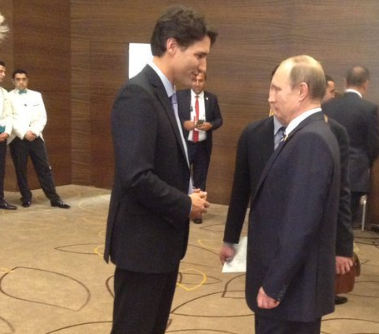 For the current lists of Canadian sanctions against Russia, click to open. 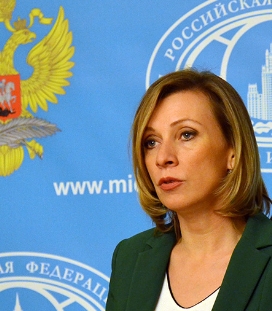 Unofficially, the Russian assessment – based on contacts with the Foreign Ministry, veteran diplomats, and Russian oligarchs with Canadian business interests — is that Canada is a minor country whose international role-playing is either that of a foil to the US, as when Pierre Trudeau , Justin’s father, was prime minister and opposed the US on the Vietnam War; or the role of a puppet and echo of Washington. The Russian oligarch connexions have included Roman Abramovich’s attempt at goldmining with Peter Munk, founder of Barrick Gold; Oleg Deripaska’s scheme for acquiring the Opel car company with Frank Stronach of the Magna Corporation; and Alexei Mordashov’s goldmining ventures with Frank Giustra. The contacts have all ended unsuccessfully, as the Russians see it. 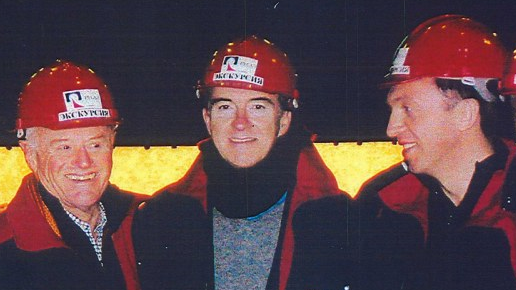 From left to right: Peter Munk, Peter Mandelson, then EU commissioner for trade; Oleg Deripaska, on an ill-fated trip to visit Deripaska’s assets in Siberia. Their trip was exposed by a London newspaper and subsequent UK court rulings; for details of Munk’s and Deripaska’s scheming, read this. Russian and Canadian sources also believe Freeland had been plotting Dion’s ouster since the two of them both contended for a senior ministry post in November 2015. Dion won; Freeland lost. Freeland is a bad loser and goes into hysterical rages when crossed, her associates at the Financial Times remember. Hillary Clinton, too — according to US press reports of her behaviour on election night last November, when she reportedly wept, swore, screamed, and was incapable of making the traditional concession speech. 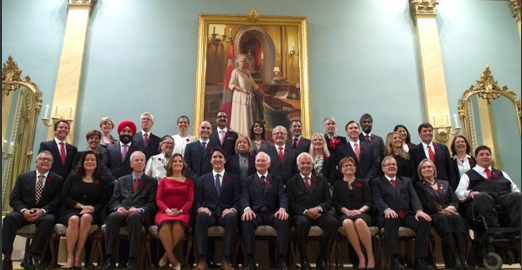 That’s Foreign Minister Dion to the right of Freeland, who sits between Dion and the prime minister. In the normal Canadian protocol, Freeland ranked 13th and should have stood in the second row behind Trudeau. Two other economic policymakers who were appointed above Freeland in rank – Finance Minister Bill Morneau and Minister of Economic Development Navdeep Singh Bains were obliged to stand behind her in the second row. Freeland also employed the Nancy Reagan ploy of being the only woman to wear red. For details of Freeland’s first see-red plot, read this. Freeland’s political scheming has been spelled out by sources who know her and her husband, a New York-based journalist named Graham Bowley who reports mainly on the art market and the troubles of former comedian, Bill Cosby. Bowley also doubles as an expert on Russian cyber-warfare, and on how undemocratic Clinton’s defeat was in November. Freeland wasn’t exceptional in expecting Clinton to win. Local polls show that 79% of Canadians thought the same. Sources in a position to know claim Freeland had been plotting Dion’s downfall in the expectation that she would appear to be the natural counterparty in Ottawa for Clinton in Washington. Without Clinton to boost Freeland’s further chances for a shot at the Canadian prime ministry, the sources believe Trudeau and his advisors are setting her up to fail with the Trump Administration. Trudeau’s reading of the domestic polls is that foreign policy issues like the conflict with Russia and the wars in Syria and the Ukraine are of next to no importance to Canadian voters. Legalization of marijuana is more important, according to this poll in mid-December. The Canadian priority is the economy, the poll also reported. Two-thirds of Canadians now think Trudeau’s performance in office is more style than substance. That percentage is up eight points since the government’s one-year anniversary, just over a month ago.